Polbo á feira (Pulpo a la gallega in Spanish) (Galician name literally meaning "fair-style octopus") alternatively known as pulpo estilo feira is a traditional Galician dish. This dish is prepared by first boiling the octopus inside a copper cauldron. Before actually boiling it, the octopus' tentacles are dipped in and out of the boiling water three times, held by its head. The objective of this operation is to curl the tips of the tentacles. The tentacles are preferred over the head, which sometimes is discarded. After the octopus has been boiled, it is trimmed with scissors, sprinkled with coarse salt and both sweet and spicy paprika (known in Galicia as pemento and pemento picante) and drizzled with olive oil. The optimal cooking point is the one in which octopus is not rubbery but not overcooked either, similarly to the al dente concept in Italian pasta cooking. 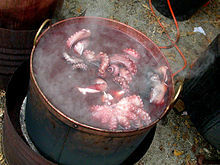 This is achieved after approximately a 40-90 minutes boil, provided that the octopus is left to rest for a further 20 minutes inside the boiled water away from the fire. The dish is traditionally served on wooden plates and bread. Tradition dictates that drinking water should not accompany octopus, so the dish is usually accompanied by young Galician red wine. Traditionally, this diatopic use of octopus was facilitated by its inland availability as stockfish. In the last decades, frozen octopus has replaced dried octopus. Fresh octopus is not so frequently used nowadays either, as it is necessary to pound it heavily before cooking to avoid the dish becoming rubbery. This procedure can be skipped after freezing, which, unlike other seafood, does not alter the organoleptic properties of octopus. The provinces of Ourense and Lugo have a reputation for good octopus cooking. 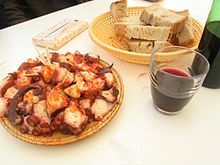 Fair style octopus is the totemic food of the patron saint festivities of Lugo (San Froilán). Some Galician cooks specialize in this dish. They are usually women, known by the name polbeiras (Galician name). After the modern decline of traditional rural fairs, many polberías (octopus restaurants, by its Galician name) have sprouted across the Galician geography. Polbeiras tend to be rough-and-ready eateries, rather than refined restaurants.